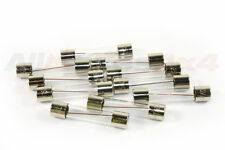 L'ensemble de venir avec 4 x 7.5 ampères, 10 ampères x 4, 4 x 15 ampères, 20 ampères x 4, 2 x 30 ampères. MPN VW65GTI1673. Besoin Ceintures arrières de faire le jeu?. Land Rover Defender 90 110 Boîte à fusibles couvercle. REMOVED FROM A LANDROVER DEFENDER 90. FOR SALE IS A USED FUSE BOX COVER. WHAT YOU SEE IS WHAT YOU GET. Part Manufacturer Lucas. Voir nos autres annonces pour les pièces de série plus insaisissables. Classic Car Part Yes. Part Manufacturer Lucas. Other Part Number be 3592. This listing is for a used part This Interior Fusebox is from a 2000 Discovery 2 V8 Please match current part number of YQE103830 as shown in photo. Genuine LAND ROVER DISCOVERY 3, 4 & RR Sport Boîte à fusibles ASSY-YQE500420.
" 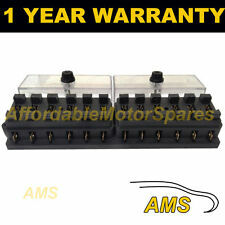 GENUINE" LAND ROVER DISCOVERY 3, 4 & RANGE ROVER SPORT FUSE BOX ASSY - YQE500420. A genuine Land Rover part. Suitable for all Discovery 3 models (2004-2009), Discovery 4 models. We specialise in Aston Martin, Jaguar and Land Rover parts. Composants Véritable Bearmach Haute Qualité. connue partout dans le monde pour les pièces de haute qualité. Land Rover Defender Jaune 20A Fusible pour lunette arrière chauffante. LAND ROVER RANGE ROVER P38 1994 TO 2001. 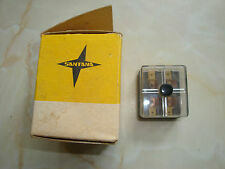 FUSE BOX GENUINE. PARTS COLOUR MAY VERY DUE TO MANUFACTURE PRODUCTION. PART NUMBERS ARE FOR REFERENCE ONLY AND DO NOT IMPLY THE MANUFACTURER. ALL SPECIFICATIONS ARE SUBJECT TO CHANGE. Part Number: YQE103800. 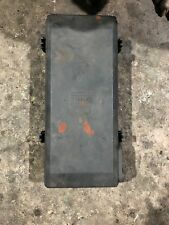 Land Rover Discovery 2 (1998 - 2004) TD5 and V8 Under Bonnet Fuse Box Including Fuses. We are a bonefide 'End Of Life' Vehicle Dismantlers situated in East Devon. We willALWAYS resolve your issue but would ask that you call us in order to do so. This listing is for a used part This Fuse Box is from a 2003 Defender 110 TD5 Please match current part number of YQE000180 as shown in photo Good used condition. As shown in photo. This fuse box is suppliedNEW. It is of excellent quality with removable cover and for reference, has the Part No.606253A and Lucas Part No.54038068. 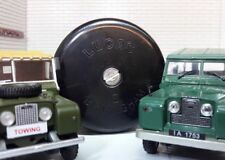 LAND ROVER SERIES IIA & III 'LIGHTWEIGHT' ; YEARS 1968-1984. Part Manufacturer Lucas. Complet avec des fixations de taille correcte et longueur inoxydable (2x inoxydable Set Vis, des rondelles et des écrous). Reference OE//OEM Number 219078. Classic Car Part Yes. REMOVED FROM A LANDROVER DEFENDER. FOR SALE IS A USED FUSE BOX COVER. Part Manufacturer Lucas. Other Part Number 606253. Manufacturer Part Number 54038068. PART NUMBER:AMR3258. WE ARE AN INDEPENDENT LAND ROVER REPAIR AND PARTS CENTRE. WE HAVE A WIDE RANGE OF GOOD QUALITY USED PARTS AS WELL AS NEW FOR DISCOVERY, RANGE ROVER CLASSIC AND DEFENDER PARTS. (JUST FOR THE FEW WHO TRY IT ON AND SPOIL IT FOR THE REST OF US). 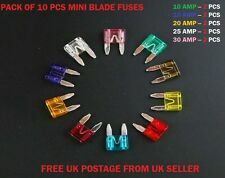 Here we have a set of 20 Mini Blade Fuse's for your Land Rover. Manufacturer Part Number 78226. Part Manufacturer Lucas. FOR SALE IS A USED LUCAS FUSE BOX. REMOVED FROM A SERIES 2A LANDROVER. Freelander 1 - TD4 - 2002 to 2006. Terrain Vehicles LTD is a family run Independent Land Rover and Range Rover specialist garage. All our used parts are tested by ourselves before we remove them from the vehicle. LAND ROVER DISCOVERY SERIES 2 TD5 OR V8 MODELS UNDER DASH FUSE BOX. WE ARE AN INDEPENDENT LAND ROVER REPAIR AND PARTS CENTRE. WE HAVE A WIDE RANGE OF GOOD QUALITY USED PARTS AS WELL AS NEW FOR DISCOVERY, RANGE ROVER CLASSIC AND DEFENDER PARTS.